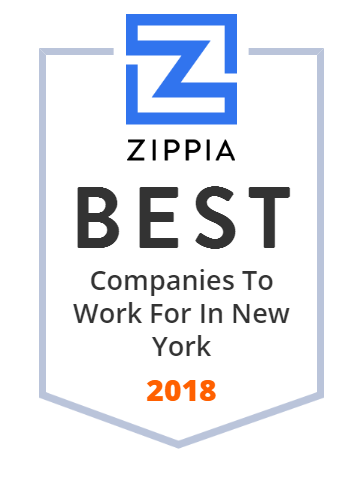 We hand-curated a list of the best companies to work for headquartered in and around New York using data on salaries, company financial health, and employee diversity. Sorry, no companies match that criteria. A&E Television Networks, LLC, doing business as A+E Networks, is an American broadcasting company that is a joint venture between Hearst Communications and Disney-ABC Television Group, a unit of The Walt Disney Company. Outfront Media, Inc. (formerly CBS Outdoor, Viacom Outdoor, Infinity Outdoor, Outdoor Systems, Gannett Outdoor, 3M National, and Transportation Displays Incorporated, among others) is one of the largest outdoor media companies. The Madison Square Garden Company is an American sports and entertainment holding company based in New York City. The company was established in 2010 when Cablevision spun off the New York Knicks, New York Rangers, Madison Square Garden, MSG Network and other entertainment assets as an independent, publicly traded company. IAC (InterActiveCorp) is an American holding company, that owns over 150 brands across 100 countries, mostly in media and Internet headquartered in New York City. Joey Levin, who previously led the company's Search & Applications segment, has been the company's Chief Executive Officer since June 2015. CBS Corporation is an American mass media corporation focused on commercial broadcasting, publishing, and television production, with most of its operations in the United States. Clear Channel Outdoor Holdings, Inc. (NYSE: CCO), is a public subsidiary of iHeartMedia (formerly CC Media Holdings, Inc.), and is one of the world's largest outdoor advertising corporations. The company is headquartered in San Antonio, Texas. Hearst owns a wide variety of newspapers, magazines, television channels, and television stations, including the San Francisco Chronicle, the Houston Chronicle, Cosmopolitan and Esquire. Dow Jones & Company is an American publishing and financial information firm that has been owned by News Corp.
WebMD is an American corporation known primarily as an online publisher of news and information pertaining to human health and well-being. Grey Group is a global advertising and marketing agency with headquarters in New York City, and 432 offices in 96 countries, operating in 154 cities. Twenty-First Century Fox, Inc. (stylized as 21st Century Fox and abbreviated 21CF) is an American multinational mass media corporation that is based in Midtown Manhattan, New York City. It is one of the two companies formed from the 2013 spin-off of the publishing assets of News Corporation, as founded by Rupert Murdoch in 1979. Forbes is an American business magazine. Published bi-weekly, it features original articles on finance, industry, investing, and marketing topics. Warner Media, LLC, doing business as WarnerMedia, is an American multinational mass media and entertainment conglomerate owned by AT&T and headquartered in New York City. Viacom Inc. (/ˈvaɪəkɒm/ VY-ə-kom or /ˈviːəkɒm/ VEE-ə-kom) is an American multinational mass media conglomerate with interests primarily in film and television. It is currently the world's ninth largest broadcasting, cable, and media company in terms of revenue, and has headquarters in New York City. Voting control of Viacom is held by National Amusements, Inc., a privately owned theater company controlled by billionaire Sumner Redstone, who also holds a controlling stake in CBS Corporation. Edelman is an American public relations and marketing consultancy firm, founded by and named after Daniel Edelman. Young & Rubicam, Inc., a digital agency, provides advertising services. The company also provides mobile advertising services. It serves start-ups and idea generators worldwide. The company was founded in 1923 and is based in New York, New York. It has additional offices internationally. As of April 4, 2000, Young & Rubicam, Inc. operates as a subsidiary of WPP plc. Ogilvy is a New York City-based British advertising, marketing and public relations agency. ASCAP collects licensing fees from users of music created by ASCAP members, then distributes them back to its members as royalties. Sotheby's /ˈsʌðəbiz/ is a British founded, American multinational corporation headquartered in New York City. One of the world's largest brokers of fine and decorative art, jewelry, real estate, and collectibles, Sotheby's operation is divided into three segments: auction, finance, and dealer. The company's services range from corporate art services to private sales. It is named after one of its cofounders, John Sotheby. Weber Shandwick is a public relations firm formed in 2001 by merging the Weber Group, Shandwick International, and BSMG. Omnicom Group Inc. is an American global media, marketing and corporate communications holding company, headquartered in New York City. Condé Nast Inc. Robert A. Business Insider is an American financial and business news website published by Insider Inc.
Newsday is an American daily newspaper that primarily serves Nassau and Suffolk counties and the New York City borough of Queens on Long Island, although it is also sold throughout the New York metropolitan area. Scholastic Corporation is an American multinational publishing, education and media company known for publishing, selling, and distributing books and educational materials for schools, teachers, parents, and children. Products are distributed to schools and districts, to consumers through the schools via reading clubs and fairs, and through retail stores and online sales. The business has three segments: Children Book Publishing & Distribution (Trade, Book Clubs and Book Fairs), Education, and International. Scholastic holds the perpetual US publishing rights to the Harry Potter and Hunger Games book series. Scholastic is the world's largest publisher and distributor of children's books and a leader in print and digital educational materials for pre-K to grade 12. The original incarnation of News Corporation was an American multinational mass media corporation headquartered in New York City. Vice Media LLC is a North American digital media and broadcasting company. XO Group Inc. (formerly The Knot Inc.) is an American media and technology company that provides content, tools, products and services for couples who are planning weddings, creating a home, and starting a family. The company generates revenue through online advertising, merchandising, registry services, and publishing. The company headquarters are located in New York City, with offices in several locations in its domestic American market as well as in international markets such as for example China. To Publish Great Books Well. Lowe & Partners Worldwide, Inc. operates as an advertising agency. The company was founded in 1960 and is based in New York, New York. Lowe & Partners Worldwide, Inc. operates as a subsidiary of The Interpublic Group of Companies, Inc.
dedicated to creating smart, conceptual and innovative content. The New York Daily News, officially titled Daily News, is an American newspaper based in New York City. Lifetime is an American pay television channel that is part of Lifetime Entertainment Services, a subsidiary of A&E Networks, which is jointly owned by the Hearst Communications and The Walt Disney Company. TMP Worldwide Advertising & Communications, LLC is an independent recruitment advertising agency Headquartered in New York City. TMP has offices throughout North America, Europe and Asia, and network partners on offices around the world. DDB Worldwide Communications Group Inc., known internationally as DDB, is a worldwide marketing communications network. JCDecaux Group is a multinational corporation based in Neuilly-sur-Seine, near Paris, France, known for its bus-stop advertising systems, billboards, public bicycle rental systems, and street furniture. Travelzoo is an Internet company that publishes deals from more than 2,000 travel, entertainment and local businesses such as restaurants and spas. It has 28 million members in North America, Europe, and Asia Pacific and 26 offices worldwide. Ziff Davis, LLC is an American publisher and Internet company. The Associated Press is a US-based not-for-profit news agency headquartered in New York City. Concert membership for people who breathe music. Fall in love with a new band every week from $25/mo. LiveStyle is a Los Angeles-based live events conglomerate founded by media entrepreneur Robert F X Sillerman. Deutsch is a manufacturer of electrical and fibre optic connectors. They specialise in extreme environments such as high temperature, pressure (altitude and depth), high vibration and many other different applications like Space, Formula 1 cars, Defense, Civil & Military Aerospace and Battle Field applications. The company is now part of TE connectivity. The American Institute of Physics (AIP) promotes science, the profession of physics, publishes physics journals, and produces publications for scientific and engineering societies. The AIP is made up of various member societies. Its corporate headquarters are at the American Center for Physics in College Park, Maryland, but the institute also has offices in Melville, New York and Beijing. We are an integrated communications agency delivering media and marketing solutions globally. Custom trade show exhibits, environments, and events firm specializing in design, fabrication, and service. Broadcast Music, Inc. (BMI) is one of four United States performing rights organizations, along with ASCAP, SESAC, Pro Music Rights and SoundExchange. It collects license fees on behalf of songwriters, composers, and music publishers and distributes them as royalties to those members whose works have been performed. In FY 2017, BMI collected more than $1.13 billion in licensing fees and distributed $1.023 billion in royalties. BMI's repertoire includes over 800,000 songwriters and 13 million compositions. Guest of a Guest is a website founded by Cameron Winklevoss and Rachelle Hruska that covers high society events, people, and places. The authority on innovative solutions for savvy lenders entering the Non-QM market. Stay up to date with news and insights from our lending experts. TheStreet, Inc. is an American financial news and services company founded by Jim Cramer and Martin Peretz. Zeta Global is customer lifecycle management marketing company which was founded in 2007. The privately owned company's headquarters are in New York City, with 25 additional offices worldwide, including Silicon Valley, London, as well as Chennai and Hyderabad in India. Zeta has more than 1300 employees worldwide. Hollywood.com, your source for fun in Hollywood. We break down the best movies, celebrity trivia, and where your favorite child stars are now! BuzzFeed, Inc. is an American Internet media and news company based in New York City. Between 2008 and 2012, Newsweek experienced financial difficulties, leading to the cessation of print publication and a transition to all-digital format at the end of 2012. Hoolux Medical is a cutting-edge technology company that serves health and wellness content to engage and educate patients in point-of-care locations. FunGoPlay is an online sports theme park that rewards kids for real world active play! The New York Post is a daily newspaper in New York City. Dentsu Aegis Network Ltd. is a multinational media and digital marketing communications company headquartered in London, United Kingdom, and a wholly owned subsidiary of the Japanese advertising and public relations firm Dentsu. Tomorrow's major technology & media platform, for a mobile-first world. Dance Theatre of Harlem is an American professional ballet company and school based in Harlem, New York City. The Metropolitan Opera House is an opera house located on Broadway at Lincoln Square on the Upper West Side of Manhattan in New York City. Music Choice is an American company which produces music programming and music-related content for digital cable television, mobile phone and cable modem users. The Brooklyn Academy of Music is a performing arts venue in Brooklyn, New York City, known as a center for progressive and avant garde performance. The Harlem School of the Arts empowers people through #music, #dance, #theatre, #visualarts, and #musicaltheatre. A future in the #arts begins here! Media Made Easy™▪Streaming, Live Stream Test, optimized CDN, owns custom SaaS + PaaS media MGMNT system▪N.Y. State corp. All Rights Reserved. Amper is an artificial intelligence music composer and API that creates & customizes original music for your content. We help businesses and organizations define their essence, express their brands, humanize their technologies, launch their products, and cultivate their conversations. Bartle Bogle Hegarty is a global advertising agency. Epic Lives Here. Videos You Share Live Here. Always Relevant. We are a digitally-led creative agency with the resources and drive to create beyond the curve. We move at the speed of culture. strongly believe that collaboration is the key to creating great work. We are the agency that's utterly focused on the individual. Ruder Finn Group, Inc., through its subsidiaries, operates as a communications, counseling, and service organization. It provides various public relations services for corporations, government agencies, and cultural organizations. The company was founded in 1948 and is based in New York, New York with additional offices in Boston, Massachusetts; Chicago, Illinois; Los Angeles and San Francisco, California; Washington D.C.; London, the United Kingdom; Paris, France; Basel, Switzerland; Jerusalem, Israel; Beijing, Shanghai, and Guangzhou, China; Hong Kong, Hong Kong; Singapore, Singapore; and Sydney, Australia. Cross Media Marketing Corporation operates as a direct marketing company in the United States. The company executes targeted and interactive sales campaigns utilizing multiple direct marketing channels, including inbound and outbound telesales, print advertisements, Web marketing, and email. It sells various products through these multiple channels, including multi magazine subscription packages, discount buying club memberships, and collectibles, as well as lifestyle products, including videos, music, coins, collectibles, jewelry, horticulture, and other general merchandise. Cross Media Marketing Corporation was formerly known as Symposium Corporation and it changed its name in December 2000. The company was founded in 2000 and is based in New York, New York.